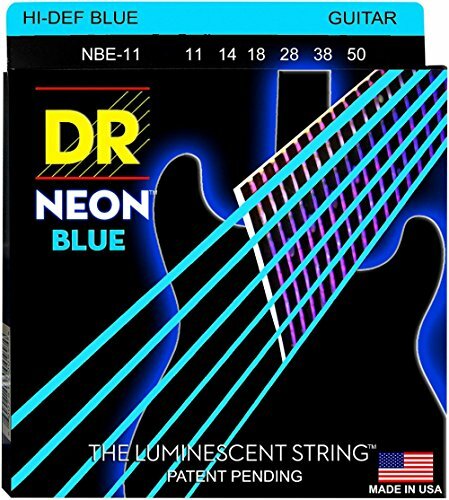 DR Strings Hi-Def NEON Blue Coated Medium (11-50) Electric Guitar Strings by kpop at Debbie Dee Music. MPN: NBE11. Hurry! Limited time offer. Offer valid only while supplies last. Hi-Def NEON Blue Coated Medium (11-50) Electric Guitar Strings. DR NEONs are super bright color coated strings that sound clear, bright and musical. Hi-Def NEON Blue Coated Medium (11-50) Electric Guitar Strings. DR NEONs are super bright color coated strings that sound clear, bright and musical. Players love the bright NEON colors and their remarkable sound. Super bright in daylight and under stage lighting, DR's NEON 100% black light active and glow strongly under UV lighting. NEONs are the first coated string to make no apologies. While NEONs last as long as a coated string should (three to four times as long as uncoated strings) they sound as good, or better, than uncoated strings. These ones are blue, guage .011 - .050 for electric. If you have any questions about this product by kpop, contact us by completing and submitting the form below. If you are looking for a specif part number, please include it with your message.